Home » Diet » Top 5 Health Benefits of Rambutan! Top 5 Health Benefits of Rambutan! The sharp and hairy appearance of the Malay-Indonesian and Southeast Asian originated Rambutan might make it look like an aggressive lychee imposter, but this exotic fruit has a unique health benefit profile. The Nephelium lappaceum, (Latin) comes from the Sapindaceae family of flowering plants, which is also responsible for some more familiar favourites such as maple and guarana. While commonly sold and consumed in the West as a canned food floating in syrup, its consumption as a whole food can maximise some of its lesser-known valued attributes. Stay with us as we explore the Top 5 Health Benefits of Rambutan! A 100g serving of rambutan contains approximately 40mg of vitamin C – which is 100% of the UK RDA. High amounts of vitamin C have been found to increase recovery rate and aid in reducing catabolic stress responses when consumed directly after from strenuous exercise. The addition of a few of these colourful, fragrant fruits to your post-workout smoothie bowl could lead you to feeling both hungry and capable of doing it all again in no time, in the knowledge that you have a deliciously vitamin-enriched reward to look forward to! Rambutan has a relatively low calorie content and very low fat content. With the majority of calories coming from slow-release carbohydrates, these water-dense fruits give a good sensation of satiety (or not feeling hungry), isn’t that another reason to opt for the fruit bowl rather than the biscuit jar when you feel like snacking? The often discarded rind of the rambutan has been found to have a high phenolic content and significant antioxidant properties. Phenolics improve the immune system’s ability to recognise and eliminate cancer cells, while also inhibiting the development of new blood vessels that contribute to tumor growth. Antioxidants are also known to neutralise free radicals, further helping to prevent any unwanted cell activity from occurring. 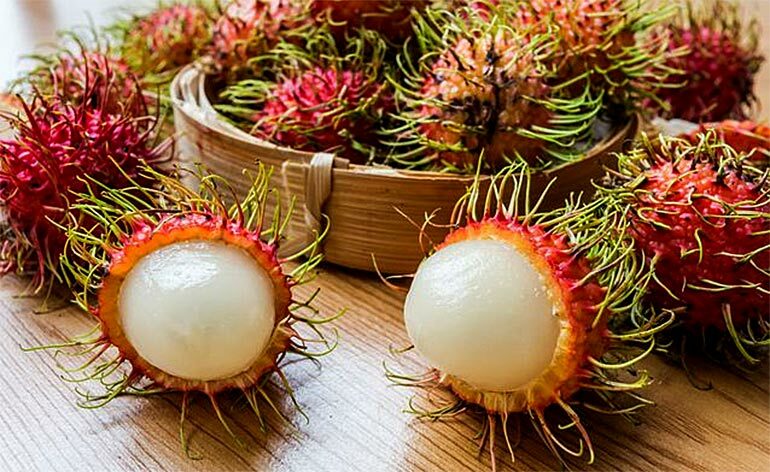 In addition to potentially providing an insurance policy against the formation of cancer cells, a study from 2011 suggested that the rind of the rambutan may also act as an anti-hyperglycemic agent, making it beneficial in the treatment of Type 2 diabetes. The rind has been demonstrated to be significantly more effective in slowing the breakdown of carbohydrates into sugars (thus regulating blood sugar levels) than mainstream medication designed to do the same thing. Another often overlooked byproduct of rambutan are the medicinally rich seeds which are generally considered unpalatable due to their slightly bitter taste. The bitterness is partly due to the presence of saponin, which acts as a ‘detergent for your stomach’ absorbing excess bile acids (made using cholesterol) by allowing excess cholesterol to pass through the body as a waste product. Whether you’re looking for a herbal remedy to a specific problem or are simply intrigued about introducing this tropical treat into your diet and kitchen, getting it into your system (regardless of its intimidating appearance) is well worth a try! Tell us about your experiences with this unusual fruit with built-in Asian persuasion below or @ KeepfitKingdom ! 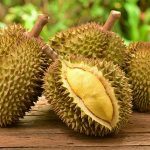 Top 5 Health Benefits of Durian! Top 5 Health Benefits of Walnuts!